Wakulla County, Florida offers a variety of attractions for recreation, entertainment, shopping and dining in the beautiful panhandle of Florida. 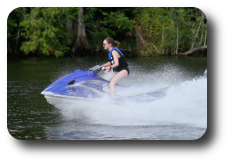 Outdoor recreation is a top attraction for Wakulla County and its communities. 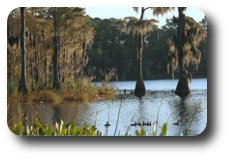 Wakulla Springs State Park is one of many natural attractions just minutes from downtown Crawfordville and the City of Tallahassee. There are many opportunities for kayaking, canoeing, swimming, golfing, camping and fishing through out Wakulla County. Wakulla Springs State Park visitors may also be able to view endangered manatees as well as cruise down the Wakulla River in a glass bottom boat. The Apalachicola National Forest is also located within the county, providing hiking trails, boat ramps and camping areas for both tents and RVs. Visitors will be able to take in an ecosystem that includes sinkholes, cypress pines and pine forests. Birdwatchers and fans of other wildlife will find much to do in Wakulla County, with its bald eagles, herons, owls, hawks, American alligators, gopher tortoises and squirrels abound in the region. Visitors who are looking for a marine experience can view sharks and sea turtles among the collection of sea horses, crabs and other marine life found in the Florida Gulf Coast region. These animals are seen at the Gulf Specimen Marine Laboratory. The non-profit aquarium has the largest array of "touch" tanks, allowing visitors the opportunity to get up close with thousands of specimens of marine life. There are also a large number of traditional viewing tanks. The St. Marks Trail is a 16-mile paved trail along the route of the former Tallahassee-St. Marks railroad. Visitors may use the trail for biking, jogging, walking, skating, dog walking and horse riding. Part of the trail is also recognized as part of the Florida National Scenic Trail. The story of Florida's heritage is also present in Wakulla County. Visitors can step back in time during a visit to San Marcos de Apalache Historic State Park. Spanish explorers first passed through the area in 1528, establishing a fort at the site in 1679. Future U.S. President Andrew Jackson would occupy the fort in the early 1800's. A museum is located at the site and holds artifacts left at the fort. The park is free for visitors. The St. Marks Lighthouse is also available for visits. 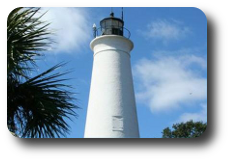 This lighthouse dates back to 1831, and was in service for various tasks during the Seminole War, was attacked by Confederates during the Civil War, and withstood several tropical storms and hurricanes over the years. Visitors can shop and dine through out Wakulla County. With a variety of dining choices from Mexican, Chinese and southern style dishes in Crawfordville to pizza, seafood and steaks in Panacea, St. Marks, Ochlockonee Bay and Sopchoppy. It is in Wakulla County that visitors can stop in some of the South's most quaintest shops to buy the latest style clothing or a charming antique. Annual festivals also add to the entertainment available in our area. And of course every golfer will love to play golf at the Wildwood Country Club and relax at the serene Wildwood Inn located in Medart.